Therapy for Children…..Or is it just Coaching? Children are ‘learning machines’. They take in information and absorb it like a sponge. They observe, listen and feel, all the stuff going on around them. Being a ‘learning machine’ is both a great thing, and a not so great thing. This information is what goes into making them the people they are becoming, and because this information is coming into a mind that isn’t yet fully ‘on-line’, they sometimes make errors in their processing of this information. These processing errors can result in what we might consider ‘bad behaviour’, lack of confidence, bed-wetting, reluctance to go to school and all sorts of other problems. Isn’t it just that my child is being naughty? Let’s face it, young children believe that they are the centre of the universe. Their young minds don’t really understand that there is a great big world out there, that they know little about. So on any given day, their teacher at school may be having a bad time, having just been berated by the Head for not getting a report out on schedule. The teacher goes back to class, and being in a bad mood, now takes it out on the pupils in some way. Little Johnny, not understanding the finer points of relationships, just hears that he is stupid if he gets his 2x tables wrong, and believes that it must be true. So this can be more about beliefs and frustrations that a child has. Clearly, this is a fictitious scenario, though based on real situations. It is the kind of situation that can have lasting influence on the way we think and feel about ourselves. In addition to other experiences in life, this, over time lead to bad or unhelpful behaviour developing in children. So do all children need therapy or coaching? You might get the impression that I think that therapy for children is a necessity to help them develop through childhood. I don’t actually believe that there is a need for children to be ‘in therapy’ as such, but it can be a useful thing to have sometimes, to help coach a child through a difficult time. Working with children is something that I have done quite extensively over the years. Having two grown up children of my own helps me know a little about the difficulties that this can cause within a family. More recently, I’ve been trained as an Ollie Coach, which has further enhanced my way of working with children at a level that can be a relatively quick and affective. If you would like to know more about the origins of Ollie, click here. 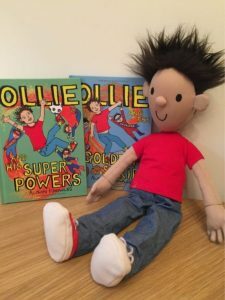 The Ollie books are available for you to read with your children, and you can find them by clicking here.